Amsonia is a relatively small genus with a few species that offer outstanding ornamental value. Amsonia illustris is perhaps the boldest of the Amsonias, a little taller and showier with shiny green leaves and larger blue flowers. Known as the ‘Shining Blue Star’ this is a striking, smooth perennial that maintains a graceful appearance throughout the growing season. 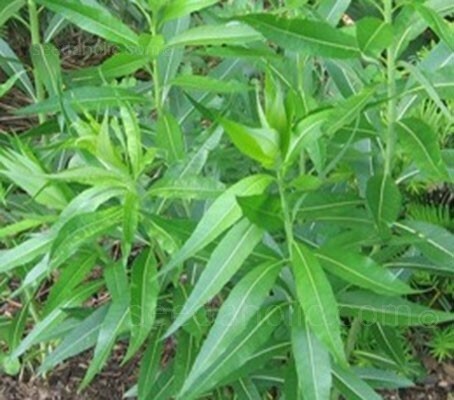 The alternate shiny leaves are willow-shaped, narrowly lanced to 15cm (6in) long, leathery and shiny on the upper surfaces. The foliage stays green through summer and turns a brilliant gold in the autumn. Amsonia illustris is a low-maintenance plant, that form tight clumps with a stout, vase shape. They flower reliably year after year, they are not pushy or invasive, they are rarely fussy about soil or situation and they are very hardy. 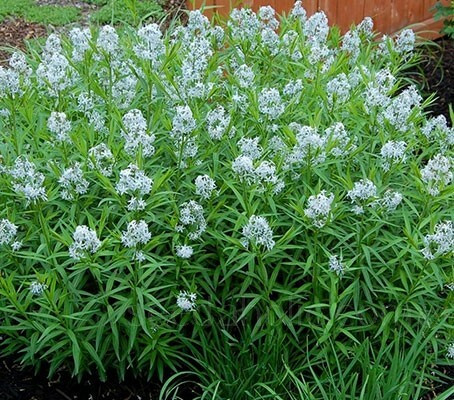 During April and May, the star-shaped, rich, light blue flowers appear, they are clustered in panicles at the tops of the stems and have a delicate scent that is highly attractive to butterflies. At three or more years, they can reach between three and four feet tall and be equally wide. If height becomes an issue, it can be pruned back a third or a half in mid-summer, and new growth will appear almost immediately. They do not need regular division, staking or fertiliser, as this may cause plants to flop. The plants grow happily in sun or in dappled shade and cope well with drought. You will seldom have reason to water this tough, hardy perennial. It performs best when cut back to the ground in late winter before new growth occurs in spring. Native to the eastern US, Amsonia illustris can be found in wet soils from eastern Kansas and southern Missouri, Nevada and south to Texas. It most frequently occurs in sandy or rocky soils on gravel bars or along streams in the Ozark region of the state. The specific epithet illustris is from the Latin illustrissimus meaning bright, shining, brilliant, illustrious. 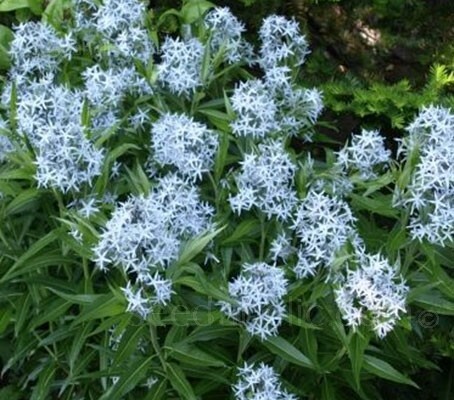 Commonly known as the ‘Shining Blue Star,’ is named for its glossy leaves and light blue blooms. Powder-blue with five slender petals.